Now, I know it's easier to go grab a can of Libby's pumpkin off the shelf, but if you have a pumpkin or if you're feeling your cooking mojo, then it's not hard to make your own pumpkin puree. 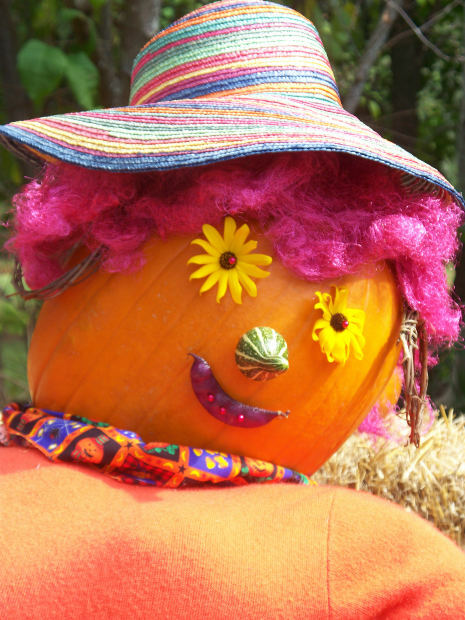 In the south, jack-o-lantern pumpkins are called cow pumpkins and generally fed to the livestock. Cooking pumpkins are the smaller, darker colored pumpkins that don’t look as pretty. Of course, I guess it's all in what you consider pretty though. If you use your jack-o-lantern pumpkin, then increase the spices called for in the recipe. Otherwise, your dish will taste kind of bland. 1. Baked Fresh Pumpkin – Preheat the oven to 350 degrees F. Cut the pumpkin in half and clean out the seeds and stringy stuff. Cover a baking sheet with tin foil. Brush a little melted butter on the cut edges of the pumpkin. Place the sides cut side down on the cookie sheet. Cook for around an hour or until the pumpkin is soft. Cool. Remove the pumpkin skin. Cut into pieces and blend or put through a food processor until the mixture is smooth like canned pumpkin. 2. Boiled Fresh Pumpkin – Remove the seeds and strings. Peel and cut the pumpkin into chunks. Put pumpkin chunks in a large pan. Cover with water. Bring to a light boil. Cook until tender. Cool. As with the baked method, blend or food process the pumpkin until smooth. 3. Microwaved Fresh Pumpkin – Clean seeds and strings out of pumpkin. Cube with rind on. Place chunks in a microwave safe bowl and cover loosely with plastic wrap. Cook on medium until soft. Check every 5 minutes as microwave times vary. Once chunks are cool, peel off the rind. Blend or food process until smooth just as in the other methods. 1. Put the pumpkin puree in a saucepan and cook over medium heat. Cook until it reaches the consistency desired. This just takes some of the water out of the fresh pumpkin. 2. Line a strainer with cheesecloth or coffee filters. Place the strainer in a big bowl. Pour the fresh pumpkin in the strainer. Leave this in the refrigerator over night. The excess liquid will drain off and can be rinsed away the next morning leaving you with thicker pumpkin.